As the tittle says,I want to remove the properties feature because the feature isn't something I want to install. Perhaps is caused by rootkit,however my ESET doesn't detect anything. Look at screen-shot below,the properties option that I highlighted is what I want to remove,but I dunno the way to remove properties option. Please tell me the location where the properties feature located then I want to remove it as soon as possible. P.S : Please don't advice I try other AV because I just want to remove the option manually. From your screenshot it looks like you are right-clicking a .exe? If so I might have a solution. Run "regedit" (Start>search for "regedit"), then expand "HKEY_CLASSES_ROOT". 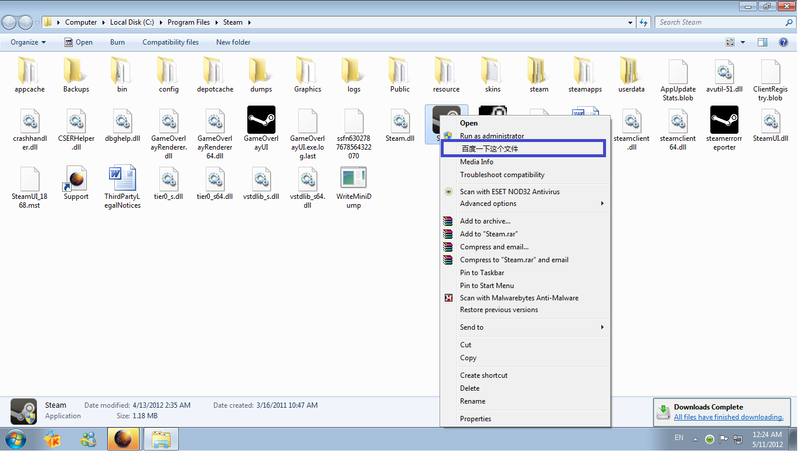 Scroll down to a folder named "exefile" and expand it then expand the folder named "shell". Hopefully that Chinese lettered option will be there. If it is, try to delete it and see if that solves your problem. EDIT : Solved,for those anyone who have this problem,please follow my solution step that I used to solve it. Shell Extensions are in-process COM objects which extends the abilities of Windows operating system. Most shell extensions are automatically installed by the operating system, but there are also many other applications that install additional shell extension components. For example: If you install WinZip on your computer, you'll see a special WinZip menu when you right-click on a Zip file. This menu is created by adding a shell extension to the system. The ShellExView utility displays the details of shell extensions installed on your computer, and allows you to easily disable and enable each shell extension.